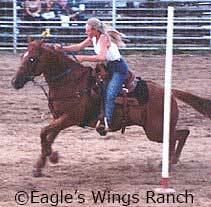 Eagle's Wings Ranch offers barrel racing and pole bending lessons. Beginners to advanced and problem solving. Lessons are $40 and last 45 minutes to 1 hour. Students must have their own horse. Please email to set up an appointment for lessons. *I offer Gift Certificates--Gift certificates are great for placing in the stocking, or a gift box! Perfect gift idea for the barrel racer (or soon-to-be barrel racer!) in your life. 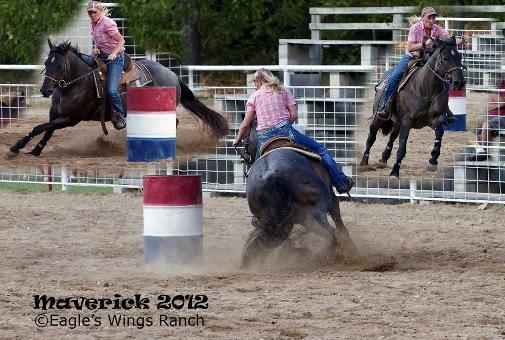 We also offer custom barrel racing clinics. We no longer schedule open clinics but set them up by request. So, put together a group of friends who want to learn how to barrel race or improve on their barrel racing skills and contact me by email to set up a clinic! *Please note: I have set aside Sundays for the Lord and will not be offering any services on Sundays. I would be happy to set something up with you on any other day of the week. Genesis 50:9 "And there went up with him both chariots and horsemen; and it was a very great company."